I bought a 2007 XL1200c Sporty in April. This pic is the day it was unloaded from the trailer. I was so excited to have my very own bike. I am still in the learning process and it is going slow due to having tennis elbow all summer. But, I am not giving up. The weather isn't being agreeable here in Oklahoma either but plan to practice on every sunny day all winter so that next summer I can actually start riding. My dream bike is a HD Deluxe and plan to get one as soon as I have mastered the Sporty. Men tell me the Deluxe is too big for me but I loved it from the moment I sat on one. 11 grandkids think it is pretty cool that Nana is learning to ride a bike. One said "At least we know she won't be sitting in a rocking chair knitting." I want to show my 9 granddaughters they can do anything they want. Even ride a bike like the big boys. Learning to ride at an older age is harder, I think. Maybe because when you're younger you don't think about the pain, you just do it. At an older age, at least for me, you think about if I drop this thing, it's gonna hurt. Wish I had done this years ago but I see lots of post by women my age that have learned and it encourages me to go for it. I have taken the MSF course but did not pass due to troubles with the quick stop. Plan to go back and retake to get my endorsement. The instructors I had were not the most encouraging and really hurt my confidence but I've always liked a challenge and don't EVER tell me I can't do something. This is another opportunity to teach my kids and grandkids, you don't give up. You keep trying until you get it right! And age and gender are not a factor. Thank you to all the women that post on here. You may not realize how much your comments and admissions of the trials you have had help others to continue to pursue their dream of riding. You are all my constant encouragement and have helped me to regain the confidence that I too can do this. Thumbs up to all of you I see on the road, you too encourage me to be a part of what you have achieved and to one day enjoy the ride. Well, I finally did it. Passed the MSF Course this weekend. Had an awesome time. It was again, exhausting, stressful but a lot of fun. Highly recommend this course to all new riders. Went back to the same instructors and this time they were great. Very encouraging. Maybe they also learned from the last experience. My daughter-in-law went with me and she passed also. We can now begin our journey of riding. The first experience was so tough, it took me a while to get up the nerve to go back to the same one. But figured this one was free, if it was the same, I'd then look for another one. Turned out to be a great experience. So glad I did this and did not just give up. So if anyone out there had a bad experience, give it another shot. Don't give up. Well summer is on its way and I'm ready to try again. I did purchase a 250 to practice on and having fun riding it around. Getting bored with the parking lot and ready to do more around the neighborhood. Planning on taking the MSF course again and know I'll make it this time. Think I'll try a different instructor this time even though it will cost me. Love reading all the experiences of other ladies learning to ride. Still dreaming of the day I can get a Deluxe. I just love the way they look and the way they feel. But, first things first. Got my 250, then my Sporty, then on to a Deluxe. Wish me luck and keep the encouraging messages coming. I know I'm not the only one out there that appreciates the encouragement from all you experienced and rooky riders. I had the clutch assist installed on my 1200L-08 about 3 mos. ago and it helped about 70% really helped a lot. Try it you will like it. I live in Okmulgee. Maybe we will pass each other soon. Hope you get better instructors this time. Good luck! Thanks, I'm not giving up yet. Waiting for this weather to settle down and going to lower my bike, put on new bars that fit me better. A friend has a small bike I'm going to practice on till I get the mechanics down then I'm going to mine. At least that's the plan right now. Get nervous at the thought of going through the MSF course again but I'm going to do it! Think I may try a difference course however. I'll be looking for that red Honda. Where in Oklahoma do you live? I'm in Muskogee. I do appreciate your encouragement. I love your bike! I am sorry that your instructors were not the greatest, but don't give up. I live in Oklahoma too. So if you pass a red Honda Shadow with a blonde lady riding her, it's me. Keep riding and stay safe! My hat's off to all you gals who are over 50 and decided to ride. I myself bought my first bike (1200 Custom Sportster) a year ago. I'm 48 and have loved every minute of it. My instructors were great and very encouraging. My dream bike is the Custom Deluxe, it was the first bike I sat on when I began looking. I do experience stiffness in my left hand and wrist after riding. The "clutch assist" sounds like a good idea. Has anyone looked into adding the "Swint pro kit LED Ice lights" to their bikes? It sure makes you more visible at night. Good luck to all of you and remember "Sunny side up!" 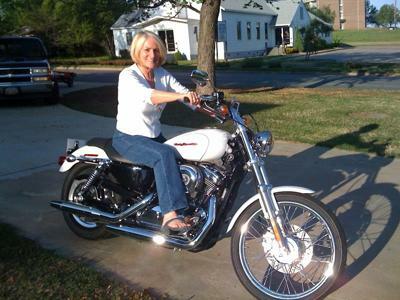 I rode powder puff since 1976, when I turned 50, walked into a dealer on vacation and brought home a 883L, never drove even a dirt bike or a riding lawn mower. Just bought a 1200L so I could also keep up with the group and love it. Also just joined Women On Wheels and I am so looking forward to next year so I can ride and not wait for mu hubby. Best of luck. I think we as women have to start patting are selves on the back. We all still look just as good as a grandmother!!!!!!!!!! I am 64 years old and I have a XL1200L Sportster. I have trouble with my clutch also because I have arthritis in my hands. My husband said that there is a clutch assist that can be added and will greatly improve that problem. I think you are right about all sportsters having that problem. When I took my MSF class in Alabama, the instructors were really great. Before I took the MSF class my husband helped me for about two months and it really gave me a head start before I took the class. Don't give up you can get through it next time. I just bought a 2007 1200L this last weekend. I have a 2005 Sportster Standard that I bought as my starter bike. I put around 2,000 miles on it, and love "Betty", but this 1200 came into my life for a really good price and I think this will hold me for many years to come. She has alot more power than my 883. My hubby, and all the other friends we ride with have bigger bikes (my hubby has a Heritage) So with the 1200 I can keep up better, also don't have to fuel up as often and it has fuel injection vs the carb in my 883 so I'm loving that. As far as the clutch goes to all who have issues with it being stiff, the Sporsters are all I've ridden myself, so yes, my hand get's sore, but I don't know any different. However, they do make a a thing called "clutch assist" (I think) Harley told us girls about it when I attended a Women's Garage Party put on by Harley for Women who ride or want to ride. They talked about all the different modifications avail to make riding easier for women. You might ck into it. Happy Trails! The clutch on mine is very stiff also. I know the clutch on my husband's Street Glide is not near as hard to work as mine. So guess that may be just something with the Sportsters. And you look great for having 11 grandkids! My husband first got me a 2005 xl 1200 Roadster Sportster. Sadly I had trouble with it. The clutch was really stiff on mine so I couldn't take off smoothly.Was just wondering if it was just my bike or are all Sportster clutches stiff like that? I loved the bike but couldn't get the hang of it so I got a Suzuki Boulevard s40 instead. We still have the Sportster. My husband switches back and forth from riding that and his Harley Fat Bob. He loves both bikes!My dream bike is a Soft Tail. Love the bike, and congrats on getting it. I live in Oklahoma too and I have been riding my own for 3 years now. People told me I was crazy when I started riding, but I have kept with it and I love it. I am sorry that your msf instructors were not so nice. Not all of them are that way. Mine were great. So don't give up. Keep riding and stay safe.